Great pasta is not limited to spaghetti and marinara. Oh no! One of the best pastas ever invented is Fettuccine Alfredo. This wondrous blend of butter and melted Parmesan cheese is just the thing to make your taste buds sing. Alfredo Di Lelio invented the dish in 1908 to convince his wife to eat after giving birth to their first child. Yep. If you’ve got the blues, this dish is good for what ails you. Heck, it’s great any time! So let’s get out there and celebrate National Fettuccine Alfredo Day on February 7. We’ll eat and enjoy one of the world’s greatest pastas. Another Alfredo's opens near Rockefeller Center in New York. Alfredo and son Armando open the Il Vero Alfredo (The True Alfredo). Movie stars Douglas Fairbanks and Mary Pickford try Fettuccine Alfredo during their honeymoon and love it. Trying to get his ailing wife to eat, Alfredo di Lelio invents Fettuccine Alfredo. Alfredo di Lelio begins working in the restaurant owned by his mother, Angelina. Check in the gift ideas where you can find a pasta machine. Making your own noodles is easy and fun! The recipe is very simple, but you don't have to stop there. Get creative and add spinach or zucchini. Become a noodle-making wizard! Got your pasta machine already? Ready to show off your skills? Host a party! Pop open a bottle of chardonnay and invite your friends to witness the cooking process right in front of them. Even if you don't make the pasta, making Fettuccine Alfredo is a "performance," and that means sharing it with friends is fun. Gather everyone around the table and mix up a fabulous meal right before their eyes. They'll thank you for it. There's no need to stick with a single recipe. Get creative with it. Garlic and capers add great flavor textures. How about adding some protein? Alfredo goes great with nearly everything. Throw in some pan-seared scallops or broiled tuna. Alfredo sauce practically begs to be married with crab. Add some roasted chicken, or get really crazy and do surf and turf with crab and chicken! The sky is the limit! It's not just for eating, it's for watching. The recipe is so simple it can be assembled at the table in full view of the guests. Fettuccine Alfredo has been called, "maestosissime fettuccine all'Alfredo." This translates into, "Most majestic fettuccine, Alfredo style." The preparation before guests has been described as a, "Spectacle reminiscent of grand opera." Servers would raise the noodles high in the air, displaying them in grand style before serving them. How often is dinner and a show one and the same thing? Not every tasty food is also nutrient-packed. 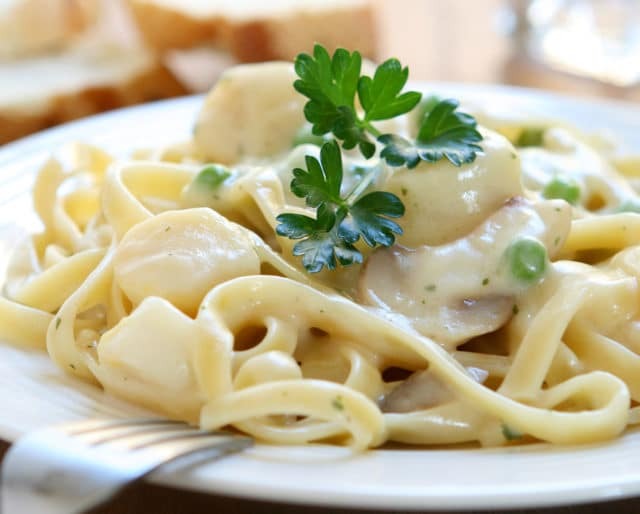 Fettuccine Alfredo provides 18 grams of protein and 30 percent of the daily recommended intake of calcium. Protein helps you immune system function and calcium is vital for bone strength and heart health. Like seeing your food? This dish provides plenty of vitamin A and that's good for preventing blindness and infections. So eat up! Actors Douglas Fairbanks and Mary Pickford were the Brad Pitt and Angelina Jolie of their day. They were on their honeymoon when they tried the amazing dish for the first time. Like most people, they fell in love on the spot. They were so amazed they donated a golden fork and spoon set to the dish's creator, Alfredo Di Lelio. Ever after he served his clients with the golden utensils. How many other dishes are worthy of golden cutlery? Not many. We don't all have golden spoons to donate but we can still love to eat it.